It’s part of an approach known as social innovation – grassroots projects that propose new responses to solve particular societal problems in order to increase people’s wellbeing. Like countless people around the world, Mike Butcher, editor of TechCrunch Europe (a technology website) was moved by the desperate plight of hundreds of thousands of refugees escaping warzones into Europe in 2015. Butcher decided to put out a call to tech companies to help improve the situation of refugees. It started a viral Facebook campaign that resulted in the launch of Techfugees, a social enterprise that aims to empower displaced people with technology. ‘I joined Mike on the very first day of this online call,’ said Josephine Goube, CEO of Techfugees. ‘And it ended up basically in an event where 300 people – NGOs, refugees and technologists – came together to discuss what we can do. It was completely organic. Headquarted in London, UK, Techfugees is an international social enterprise that organises hackathons (intensive problem-solving sessions) that bring together the international tech community – including refugees and non-refugees – to work out how tech can be used to solve problems facing displaced people. Techfugees offers design classes, teaches about privacy and security of data and creates innovation spaces. They also provide a place for NGOs working with refugees to explain the challenges they face, and use the problem-solving mentality of tech experts to come up with new prototypes of solutions. Goube says that of the 900 refugees that have so far taken part, 75 % have found a job or internship within three months of the event they attended. The project also has a high retention rate, with 70 % of the teams that win the hackathons still going one year later. While they are doing well, Techfugees acknowledge that they need a better funding support structure in the future if they are to achieve the goals they have laid out. Currently they operate from private donations and even donations from refugees, which Goube argues should not be the case. How to fund social enterprises is a big challenge and it’s one of the issues on the menu for a two-day conference on the future of social innovation in Lisbon, Portugal on 27 and 28 November. Organised partly by the EU, the event will also try to identify trends and opportunities for social innovation and how to incorporate it into public policies in the future. 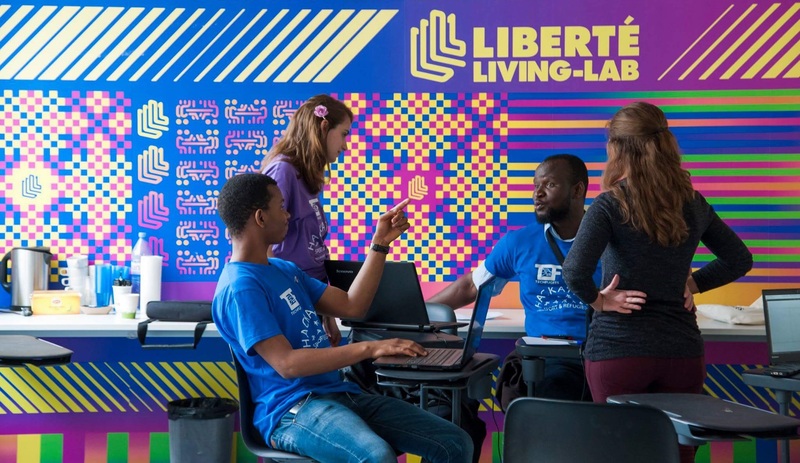 In Brussels, Belgium, sits another social enterprise – this one founded by a local entrepreneur to improve access to technology and skills development in his own community. Ibrahim Ouassari set up the MolenGeek coding school in the Molenbeek-Saint-Jean area of Brussels, which has one of the lowest average household incomes in Belgium. It started with a weekend event and grew from there. ‘This tech world is very accessible but it’s not accessible in an area like Molenbeek, so what we wanted to do is create one start-up weekend event to make this world of entrepreneurship, innovation and technology accessible in this area,’ he said. MolenGeek is a co-working space and coding school that is designed to help people to pursue a career in the tech industry or set up their own business. It has a mix of students, entrepreneurs and people who just want to learn the technical skills for their own use. They may have their own project or just wish to get the useful skills to succeed in an increasingly tech-oriented business world. Ouassari says that in our current climate, it is important to train more coders as many companies require tech skills. Coding also allows people to attain more independence and perhaps set up their own company if they have an innovative and creative idea. Even though they only launched in March 2017 – with the first code training ending in October – their success has already been recognised. Recently, MolenGeek was invited to South Korea by Samsung and awarded a prize with the view of expanding their ecosystem further, hopefully all around the world. ‘What I hope is, that we make this technology accessible and create talent and (give) young people more access (to) this world,’ said Ouassari. A two-day conference entitled 'Opening up to an ERA of social innovation' kicked off on 27 November in Lisbon, Portugal. The aim is to bring together different groups, including social entrepreneurs, policymakers, funders and students, to come up with ways to boost social innovation in Europe. The idea is to discuss what has been achieved so far, how social innovation can improve wellbeing as well as create jobs and growth in Europe, and see how it could fit into future public policies. The conference also serves to launch a report called 'Social Innovation as a Trigger for Transformations', which reviews 30 EU-funded projects with a clear focus on social innovation. Carlos Moedas, European Commissioner for Research, Science and Innovation, has announced that EUR 2 million in prize money is on offer for entrepreneurs that come up with innovative mobility solutions that help older people to fully participate in social activities, maintain their autonomy and age healthily. This will be split into one award of EUR 1 million and four runner-up prizes of EUR 250 000.